One thing that gives me an abundance of satisfaction is restoring an old photograph. A photo, that we once thought was ruined, can often times be restored to wonderfully nice quality. Have you ever thought you cannot put an old ruined photo on a newly designed scrap page? In my opinion, YOU CAN! The purpose of scrapping a page is to preserve a memory. The visual of an 'antique' picture honored by a beautiful design is something to cherish. However, that same photo can often times be touched up a little rendering it a nicer look for a page without changing the integrity of the photo's age. 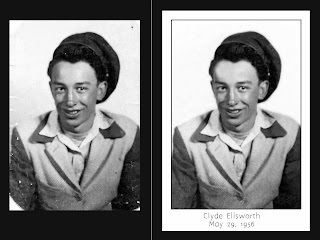 This is the before and after of a photograph a friend asked me to restore. The picture on the left is the original photo of her dad. The one on the right is the result after just and hour of restoration time. Wonderful, don't you think? I think either of these would make a beautiful photo for a scrap page, but the restoration and printing on an archival paper will give this photo even more years of life. My friend actually gave me TWO photos to restore. This one (of her dad) and another of her uncle. I guess I better get to work... how fun! I scanned the original photograph, so now my friend has the original photo, the scan of the original photo in digital format , and the digitally restored photo that can be printed on archival paper. The Challenge: to sort and let go! I believe the older you are the more photographs you have tucked away. Some in dilapidated albums or cute hat boxes. Some may even be stuffed in photo boxes you bought thinking you would take on that great task of organizing them. Maybe, they were handed down to you, so you feel obligated to treat them like they were bars of gold. If you are like me, you sometimes get them out to start organizing and you get so caught up in the memories and shuffling to see more pictures, that after a couple of hours, you just stuff them back where they came from and decide to attempt this task another day. Whew! And, if you are like me, you have done this more than once. We are lucky, however, to even have these pictures to look at. In this day of digital photography, we carry around most of our pictures on our phones or digital cameras. Some times they make it to our home computers (again, with great intentions of organizing them) and some times they don’t. We either delete them to make space for more or we lose them. How many times have you gone through the ‘pics’ on your phone and deleted certain ones because they were blurry or not someone’s best shot? Or, perhaps they are pictures of scenery that seemed important to you at the time, but now, months later, you realize that without a human reference they are pretty meaningless. The key here is that YOU get to make that decision about what to keep and what can be deleted. You should have this same privilege with your printed photos. What really scares me, is that future generations won’t value ‘my’ photos as much as I do. If I don’t take action today to create memories of these photos, then they may get in the hands of someone who will just toss them because they can’t identify the people in them or that they are so old that restoration seems impossible. I believe, however, that if they were sorted, organized, and manageable, they would be more apt to be cherished. And, that is the real point of pictures, isn’t it? To remember the people in them and cherish the memories they made for us? My challenge for you is to stop procrastinating and take action. Try to go through your photos… sort… and let go. This is the first step. Make your ‘piles’ manageable. If you don’t, those boxes of photos will remain just that, boxes that someone pulls out every couple of years to look through , get over whelmed by, and stuff back away in their storage places or even get tossed. Meanwhile, we are collecting more photos!!! This is a picture of my grandmother (front left) with her siblings (all seated on the left) and their spouses (all seated on the right). My great grandmother and great grandfather are at the head of the table and standing are many of the ‘cousins’. This picture was handed down to me in fair condition. I restored it and made it into a Scrap Page that I hope future generations will cherish, not toss. When I moved to Utah from Florida, I was introduced to the worlds of both genealogy and scrapbooking. Working in the print industry, I saw customers duplicating some pretty awesome stuff. Their genealogy research was extensive and often times VOLUMES of work. Their scrapbooking endeavors that were given the same respect. Both of these documentations of family life intrigued me and I set out to learn both. It wasn’t long before I realized that they are deeply connected to each other. Genealogy research is the documentation of names and dates of one’s family and life events, whereas scrapbooking (though modern in comparison) is the beginning of a visual history of our family and some of those same events. As for scrapbooking, it didn’t take long for me to realize the financial drain of paper scrapping. In searching online for information on how people streamline their expenses in this hobby (I could not afford to create in this medium with the cost of supplies), I stumbled upon an intriguing website.. and then another and another that were devoted to the world of Digital Scrapbooking. There were designers who were actually creating digital versions of scrap paper and embellishments! Whodathunk! I fell in love with the process almost as much as the finished pages. This was my first digital scrap page back in 2006. I hadn’t seen my son in quite a few years and he was able to come and spend a few hours with me. You can imagine how important those couple of hours were and how important it was to create that visual memory for us both.